In a heavy bottom pan roast the green gram till it emits a pleasant aroma. Then pressure cook the daal with enough water ( 4 cups) till it done (Mashed consistency). Cook sago with enough water in a pan and keep aside. 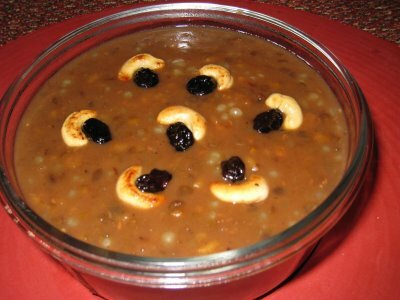 Melt the jaggery in 2 ½ cups of water and remove the impurities and add the semi Consistency jaggery syrup in to cooked/ mashed green gram and cook until it becomes a semi thick consistency. Then add thin thick coconut milk along with cooked sago. Then stir continuously for few more minutes, finally add thick coconut milk, fried coconuts, raisins and cashew nuts.